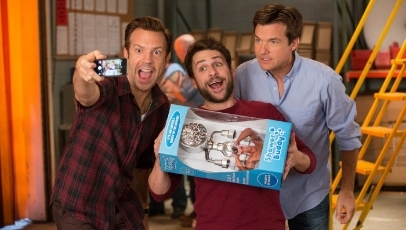 Jason Bateman, Charlie Day and Jason Sudeikis reunite for Horrible Bosses 2, a predictably bland and entirely unnecessary sequel to the 2011 comedy. While that film suceeded in at least aprtially delivering on its amusing premise, its follow-up does not. Fed up of being used and abused by their employers, Nick (Bateman), Kurt (Sudeikis) and Dale (Day) start their own business. But when their first product is stolen by investor Bert Hanson (Christoph Waltz), they concoct a plan to kidnap his son and ransom him back for the lost money. With original director Seth Gordon out of the picture, it’s left to Sean Anders to pick up the slack. Unfortunately, the finished product is more limp than energised, and the script is as paper-thin as they come, with little sense of narrative drive whatsoever. There are still one or two funny scenes, but they’re scant reprise from the padding that makes up the rest of the film. The actors, sadly, don’t pick up the slack either. Bateman, Sudeikis and Day are more exasperating than they are humourous. The supporting players, too, are left hanging in the wings for decent material that never comes. Horrible Bosses 2 is by no means an atrocity, but it’s tired and unexceptional, which is perhaps worse. This longer version of this review was first posted on CineVue.